During the band’s closing set at Justin Vernon’s Eaux Claires festival. 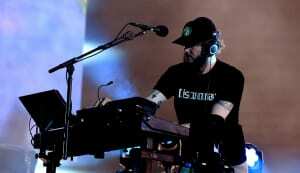 Songwriter and Bon Iver mastermind Justin Vernon recently revealed that there currently aren't any plans for a new Bon Iver record — but that didn't stop him from revealing two new songs during the band's headlining set at his Eaux Claires Music and Arts Festival in Wisconsin last night. You can watch fan-shot footage of the new tracks above.